We serve on the medical staff of the New York Giants and treat athletes at all skill levels, so it’s fair to say we know something about the punishment the human body can take and dish out. But in our private practices, too much of the pain and suffering we see in our patients has no rationale whatsoever. It stems from a big and preventable cause: muscles are overlooked as an important piece of the treatment puzzle. A sore shoulder, a tight lower back, an achy knee— in virtually everyone over the age of thirty, these problems are so common, they’re taken for granted as the near inevitable consequence of getting older. But that’s just not true. Whether tight or injured muscle is the primary cause of pain and restriction or whether the main culprit is inside the joints, the tools exist to get to the root of the problem. In the pages that follow, you will learn advanced muscle self-treatment techniques as well as stretching and strength exercises, all pegged to the most common body breakdowns. Merging our expertise as an orthopedic surgeon working in academic medicine and a sports chiropractor specializing in “hands-on” muscle therapies, we’ll also show you how we treat more serious muscle and joint problems. Our aim is to put the tools of “muscle medicine” in your hands in the service of a pain-free life. That our own backgrounds are so different has helped us appreciate how all the parts fit together. One of us, Dr. Bryan Kelly, is an orthopedic surgeon at the nation’s premier orthopedic hospital, Manhattan’s Hospital for Special Surgery, specializing in sports injuries to the hip, knee, and shoulder. He is also an assistant professor at Weill Cornell Medical College and is involved in a wide variety of research in sports medicine. The other of us, Dr. Robert DeStefano, was trained in chiropractic and, while developing busy practices in New Jersey and Manhattan, expanded his approach by teaching and developing hands-on muscle therapies. We have collaborated on both clinical and research protocols to improve the treatment strategies for patients with sports injuries. What’s different about our approach from others you may come across is that we look at the body the way nature made it, as an integrated system of bone, joint, and muscle. When there is pain or restriction, our job is to tease out the relationship among these three elements, so we can accurately diagnose and treat a musculoskeletal problem and, whenever possible, teach you how to treat yourself. What do you do when you go to an orthopedic surgeon and he says there’s no structural problem, nothing to fix? We say, there may be nothing wrong with you from his perspective, but it doesn’t mean there’s nothing wrong with you. It just means you can’t see it on an MRI or X-ray. In this case the problem may be mostly muscular. WHERE ARE THE MUSCLE DOCTORS? In our experience, the approximately six hundred muscles in the body that keep humans upright and moving are often the most overlooked element of the system. Muscle is soft tissue that can’t hold a surgeon’s stitch—it basically heals itself—so it doesn’t have its own branch of medical specialists to diagnose and treat it. Sure, any doctor will tell you muscles play a role in pain and dysfunction, but typically a supporting role—the stars of the show are supposed to be the joints, cartilage, and ligaments, in other words, the structures that show up damaged on an MRI. Minor muscle damage that may be seen on an MRI is often overlooked or viewed as clinically irrelevant. In addition, it’s subjective—we don’t yet have a numerical scale that measures muscle tightness. Yet experience has shown us that tight, damaged muscle can often be the primary cause of your problems. Even when muscle damage is the result of joint injury, it’s often the factor that holds you back from complete recovery. Take the example of a patient we treated not long ago. A former college soccer player turned business executive, he blew out the ACL (anterior cruciate ligament) in his knee playing club soccer. The surgery Dr. Kelly performed was a textbook reconstruction of the ligament, which restored stability to the knee joint. This patient seemed to have everything going for him—he was young, fit, and motivated—and yet after months of postsurgical physical therapy, he could still barely lift his leg. Dr. Kelly sent him to Dr. DeStefano, who broke up some scar tissue that had built up around the surgical site and lengthened the muscles that had tightened up after being immobilized postsurgery. Our soccer player went back to physical therapy to strengthen the muscles and was running in weeks. The point is not that something is wrong with surgery or with physical therapy (both were absolutely necessary in this case) or magical about manual muscle therapy. The point is, the body returns to health in a sequence. First, tight or inflamed or scarred-down muscles have to heal before they can be conditioned to become stronger and more flexible. Exercise an injured muscle, even in a physical therapy setting, and it might not respond and you may just injure it some more. Your musculoskeletal system takes a beating, whether from big traumas such as a torn ACL or simply from muscle and connective tissue in the joints growing inflexible and weaker with age. But some of the decline that is often written off as “normal aging” has less to do with the built-in deterioration of the cells themselves than with an accumulation of treatable muscular dinks and tweaks that were never addressed. Maybe your knees are achy and you can’t jog or play basketball the way you used to, or your wrist is sore from working at the computer all day. Over time even the “small stuff” has a way of adding up to permanent pain, a lost range of motion, and a less active life. Which is not a small thing at all. In this book, we will briefly explain how the musculoskeletal system works, and sometimes falls apart, how the lifestyle choices you make affect the system, and ultimately, what you can do to recognize problems and often fix them yourself. It happens all the time. The patient comes in needing joint surgery, but their muscles are so weak, they can’t lift their leg off the bed. I tell them, if we do surgery now, it’s going to be a disaster. I send them to Rob for “prehab” to decrease the pain and improve the function of the muscles. Other patients don’t necessarily need that, but if, after surgery, their muscles are shutting down or they’ve got a buildup of scar tissue, I send them for manual therapy on the muscles and it turns their rehab around. Now it’s almost routine. Two or three months out from surgery, if I have any inkling at all that the muscles are getting into trouble or I want them better faster, I’ll send patients for hands-on therapy. The muscle is ultimately what gets people back to normal. If you treat the bone and the joint and the muscle isn’t functioning well, the patient is just not there. 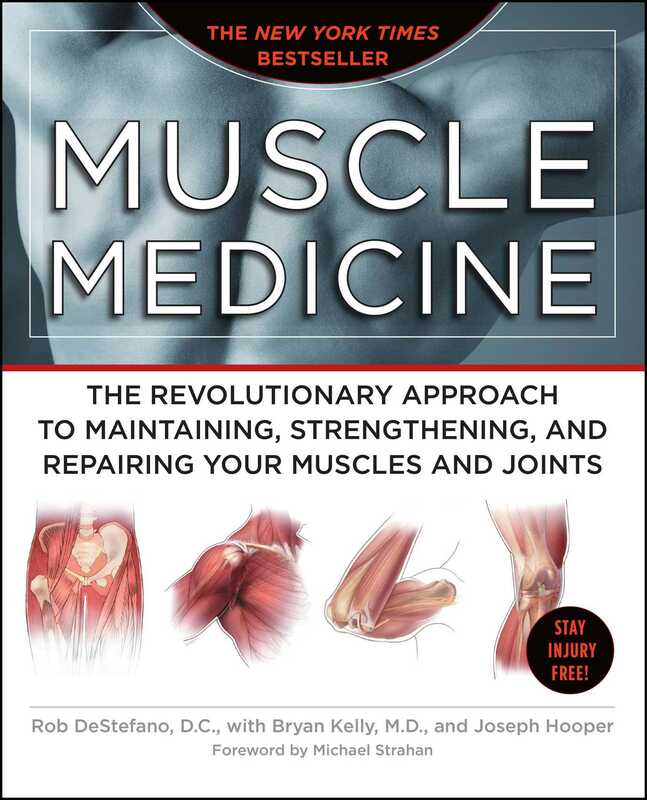 The Muscle Medicine approach to musculoskeletal health begins with a two-chapter look at the biology of muscles, joints, and bones, and at the events and forces that can do them harm. In Part Two, we move on to the choices you make in your everyday life that affect the system. A lot affects your body that’s out of your hands, such as genetics (do both of your parents have surgically replaced hips?) and luck (did you suffer a serious knee injury playing high school sports?). In these chapters, we target three important areas where you can exert some control. In chapter 4, “Mind-Body,” you’ll learn how psychological stress can wreak havoc on the musculoskeletal system and how you can contain the damage by developing a measure of control over your thoughts and emotions. In chapter 5, “Nutrition,” you’ll learn how smart food choices can support bone growth and possibly reduce joint inflammation. We’ll explain why maintaining a healthy weight will lessen the physical stress that wears down the joints. You get moving in chapter 6, with an all-around fitness plan that develops muscle and bone strength and cardio endurance, reducing the odds of injury. In Part Three, we tour the body’s seven “hot spots”: neck; shoulder; elbow/ wrist/hand; lower back; hip; knee; ankle/foot. We focus on the most common sources of pain and the decisions that people make, or don’t make, about how to deal with it. Do you ignore it? Do you stop running or swimming or playing your favorite sport? Do you explore self-treatment or seek out treatment from a muscle therapist, a physical therapist, an orthopedist? Not to be too dramatic about it, but by the time you hit your sixties, the answers to some of these questions could determine whether you’re getting ready for tennis season or another physical therapy session. In each hot spot, we’ll describe the most common problems, how Dr. DeStefano frees up tight and scarred-down tissues with “hands-on” manual techniques, and how, when the joint is seriously damaged, Dr. Kelly provides the orthopedic expertise. At the end of each of these chapters, you’ll learn how to work on yourself, to protect against injury or to come back from it. We describe a series of self-treatment techniques tailored to each of the body’s hot spots, based on the principles of Dr. DeStefano’s muscle therapy. Using your hands and a few simple items such as a treatment stick and a physio ball, you’ll learn to work directly on painfully contracted muscles to release the tissue and speed healing. Only when the area is no longer sore or inflamed will you progress to hot-spot-specific stretches to develop or maintain a healthy range of motion, and then strength exercises to build up resilience and protect against reinjury. As you’ll see, this book isn’t a laundry list or an encyclopedia of musculoskeletal injuries. (If you’re interested, plenty of books out there will give you the details of orthopedic procedures.) We’ve organized our information the same way we’ve taught ourselves to diagnose and treat problems, into three categories: Mostly Muscular; Muscle or Joint? ; and Joint/Orthopedic. In the first group, which includes most problems, most of the time, injured muscle is generating the pain; any joint damage that shows up on an X-ray or an MRI is incidental. The standard medical prescription for this group is rest and a couple of Advil. Our approach is to get at the underlying causes and then to lay out a program to treat and strengthen all the important muscles in the hot spot. With the problems that fall into our second category, Muscle or Joint?, neither the muscles nor the joint are working the way they’re supposed to, and it’s not clear who the most important bad actor is. Is the torn meniscus cartilage inside the knee the real issue, or can we bring the patient back to health just by working on the muscles that stabilize the joint? By putting these problems under a diagnostic microscope and always treating conservatively first, our goal is to eliminate avoidable surgeries. Patients in the third group, Joint/Orthopedic, have serious damage inside the joint that must be addressed, medically or surgically. Here, we work on the muscles before (prehab) and after surgery (rehab) to shorten recovery times and improve the outcome. Mostly Muscular, Muscle or Joint?, Joint/Orthopedic—this isn’t the standard approach to musculoskeletal injury, but in time we hope it will be. The good news about these injuries is that the necessary expertise is out there to fix them, even if it’s rarely collected under one roof—orthopedics to diagnose and repair joints; hands-on muscle therapy to promote muscle healing; and physical therapy/training to build up muscle and joint strength and flexibility. It’s the team approach. Working with the New York Giants for the past six years, we’ve seen the results when players have access to the best talent from these different schools of treatment. We believe readers should have access to the same expertise, even if they’re not (we hope) taking the same physical pounding as the Giants players. Wouldn’t it be nice if all-around healthy living were all that was needed to ward off muscle and joint problems? But no matter how you live your life, it’s a near certainty that sooner or later you’ll have to deal with musculoskeletal ills—they account for almost a quarter of the visits to primary-care physicians in this country. Young people playing competitive sports put their frames under tremendous pressure, from contact-sports body blows to the grinding repetition in the endurance-sports world. Adults find themselves in office jobs that have become hothouses for nagging aches and pains: lower-back pain from sitting glued to a desk; sore necks from improperly positioned computer screens; and overuse syndromes of the forearm—commonly if not always accurately labeled carpal tunnel syndrome—from all that typing and “mouse” wielding. Muscle Medicine is a manual about fighting back: how to make the right choices to address both healthy and damaged muscle, whether it’s on your own or with professional care. It lays out the first truly integrative approach to the care and repair of muscle and joint problems. Whether you’re an accomplished athlete, you want to maintain your regular tennis routine, or you just want to be able to play with your kids, or your grandkids, without back pain after a long day at the office, we want to be on your team. Every day, I treat patients who are convinced that the source of their pain is the damage inside their joint that shows up on an X-ray or MRI. A patient will come in and say, “Can you help me with my meniscus tear in my knee?” I’ll say, “No, I can’t help you with the meniscus tear, but I may be able to help you with the pain in your knee.” What people don’t usually understand is that in many cases, if we can get the muscles around the joint to move properly, the joint itself doesn’t have to be in perfect shape for the system to work without pain. That’s something I can appreciate. I’ve been in two serious accidents—once when a car hit me while I was training for the Ironman World Championships and once in a Manhattan cab crash—and I’ve got the chipped vertebrae and herniated disks to show for it. A year ago, the pain in my back and neck flared up so badly, my orthopedist was ready to bring in a neurosurgeon to work me up for disk surgery. I kept exercising, getting manual therapy, and applying self-treatment. Slowly, over a month, the contracted muscles in my cervical and lumbar spine let go their grip, and the pain went away. I’m not cured; I still have damaged disks. I may need surgery down the line, but as long as I’m symptom-free and maintain the health of my muscles, I’m fine. Rob DeStefano, DC, is a sports chiropractor, a national leader in the field of manual muscle therapies, and an avid triathelete. He divides his busy practice between offices in New Jersey and Manhattan's La Palestra health club, and he regularly consults for the New York Giants NFL football team and the Ironman World Triathalon Championships in Hawaii. Joseph Hooper is contributing editor/writer for Elle and Popular Science magazines and has been covering health and fitness since 1985.